Welcome to InMoti﻿on Dance Academy! We are continuing to offer online registration for your convenience! You will be able t﻿o securely log-in and update all of your contact information, review balances, print statements and submit payments. We also offer free Wi-Fi for your convenience in our waiting area. Click the SCHEDULE tab above to preview our class listings. We hope you enjoy our website and please don't hesitate to use the CONTACT US tab at the top to submit any questions or concerns. Click here for our 2019 Spring Newsletter. In the Newsletter you will find important information regarding rehearsals, recitals, ticket sales, volunteer opportunities, t-shirt sales, DVD and Flower sales, and picture information! Here is a link to our InMotion Dance Academy Photo Price List. Still need to turn in a Liability Form, click here to get a copy! Dances for all ages and levels! Classes are filling up fast. We have our classes listed on our "Schedule" tab or click the button below to access our Customer Self Service page. You can now register, enroll, and make payments on line! Create an account and sign up here! 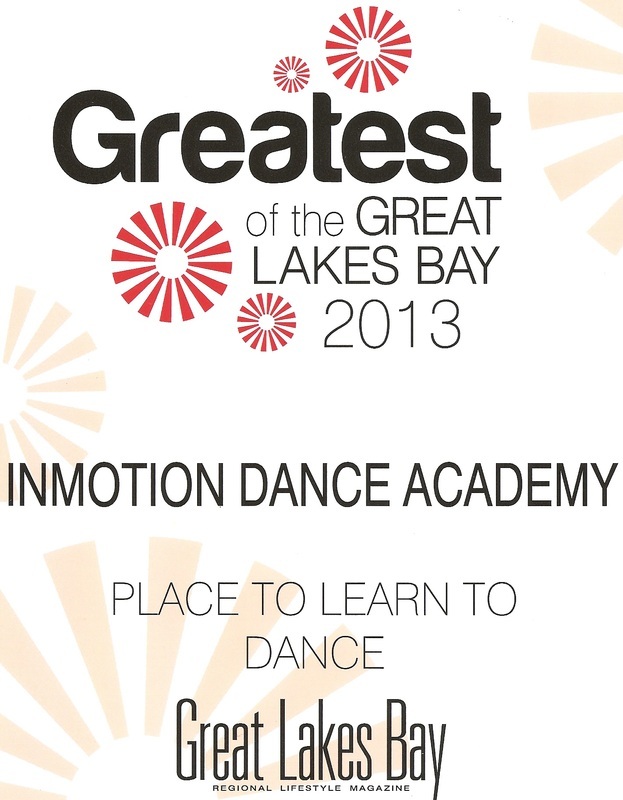 InMotion Dance Academy was recently voted the Greatest of the Great Lakes Bay area for places to learn to dance! We were very excited to receive this award and want to thank all of you for loyalty and support. We love teaching and look forward to many more years of teaching dance. Dancing is one of those short cuts to happiness. Please park in the yellow area only! As you know, parking has been a little tight. We share our parking with our neighboring businesses. To help manage parking, we have it broken into two parts. The yellow area is for InMotion and the Blue area is for all our neighboring businesses. Please avoid parking in any spaces marked with the blue stripes. Thank you for your understanding.